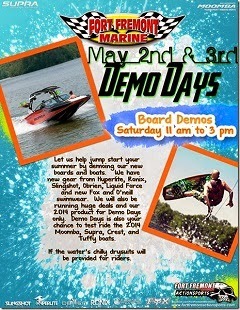 Join Supra Boats @Supra_Boats Dealer Fort Fremont Marine for their Demo Days this weekend May 2nd and 3rd! Jump start your summer by demoing new boards and boats!! Your chance to test drive the 2014 Supra Boats! Don't let the cold water keep you from this event, drysuits will be available for riders.